SINGAPORE - Singapore's non-oil domestic exports slid 9 per cent in the first three months of the year from a year ago, trade agency IE Singapore said on Wednesday (May 25). The agency has also revised its forecast for the full-year downwards, amid a lacklustre global environment. It now expects non-oil domestic exports to decline between 3 and 5 per cent this year, from an earlier forecast of 0 to 2 per cent growth. Specifically, shipments to China fell 14.6 per cent, after the previous quarter's decline of 12.3 per cent. 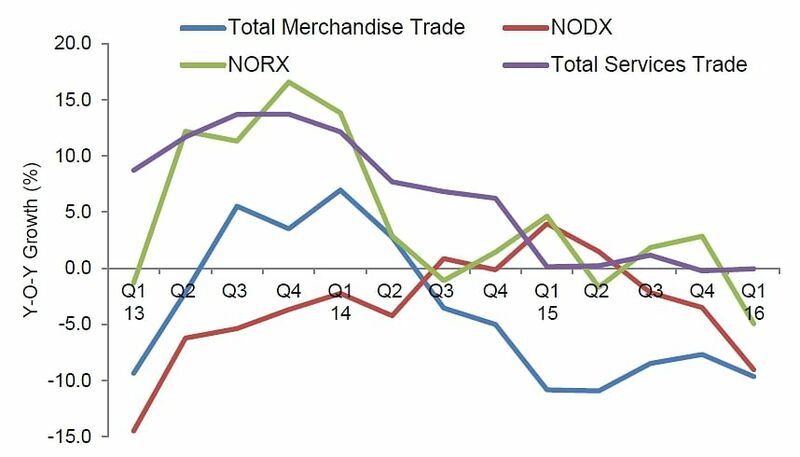 NODX to the EU decreased by 7.6 per cent, following the 2.3 per cent decline in the earlier quarter, while sales to Taiwan slumped 18.5 per cent, after contracting of 12.9 per cent. Both electronic and non-electronic non-oil domestic exports were hit.